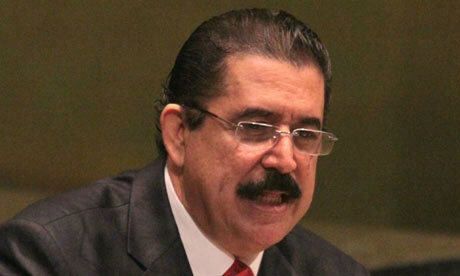 When the elected president of Honduras, Manuel Zelaya, was dragged from his bed and flown out of the country in his pyjamas last year, it was no surprise to find that this classic coup was led by a graduate of the School of Americas, the notorious army training school in Fort Benning, Georgia. But General Vasquez was simply following a well-trodden path for autocrats in Honduras – after all, two of the country’s most hated past dictators, Juan Melgar Castro and Policarpo Paz Garcia, had also attended the school. More than 60,000 Latin American soldiers have been trained at the School of the Americas – among them, the some of the region’s most notorious human rights abusers, such as Salvadoran death-squad leader Roberto D’Aubuisson. In all, 11 dictators have attended its courses: men such as Argentine junta leader, Leopoldo Galtieri, infamously responsible for the “disappeared” and Guatemala’s Efraín Ríos Montt, whose scorched earth campaign against indigenous villages, was classified as “genocide” by a UN-sponsored commission. Founded in the Panama Canal Zone in 1948, it was originally named the Army Caribbean School. It was renamed the School of Americas in 1963, and a new curriculum was introduced, offering courses in counter-insurgency, military intelligence and psychological warfare. The school was moved to Fort Benning in 1984 and, in 2001, in an attempt to improve its image, its name was changed again to the Western Hemisphere Institute for Cooperation (WHINSEC). Training manuals (pdf) used at the School of the Americas were declassified in 1996. They advocated the use of “fear, payment of bounties for enemy dead, beatings, false, imprisonment, executions and use of truth serum”, according to a Pentagon memorandum (pdf). The manuals also included detailed interrogation techniques and used the term “neutralisation”, which the department of defence admits is a euphemism for illegal execution. Those manuals have now been withdrawn from use and the anodynely-named WHINSEC offers courses in human rights, ethics, democracy and peace-keeping. But there is very little take up of these “soft” courses, according to institution’s own statistics released to Congress in 2000, and by far the most popular courses remain: commando tactics, military intelligence, psychological operations and combat training. Despite its revamped image and promise of transparency, WHINSEC has been remarkably secretive. It refused to publish the names of its military trainees and has turned down numerous freedom of information requests by campaigners. Only after a congressional vote last year, did it begin to release names and country origins of graduates. This weekend (19-21 November), thousands of people will congregate at the gates of Fort Benning to call for the school’s closure. The protest is called by School of Americas Watch, a group founded by Father Roy Bourgeois, which has catalogued the abuses of School of Americas graduates for 20 years. Protests will also take place in 14 Latin American countries, including Chile, Honduras and Guatemala. A vigil will take place in Colombia, which has sent more officers to US training schools than any other Latin American country and, today, has the worst human rights record in the region. In the last two years, the country has been rocked by the news that the army has been killing innocent civilians, then dressing the victims in guerrilla uniforms. Prosecutors are investigating more than 1,700 alleged extrajudicial killings by the security forces. Who is responsible for the grisly “false positive” murders? Well, one of the first generals sacked for involvement was Paulino Coronado Gámez, a graduate of the School of Americas. The term “neutralisation” may have been taken out of the school’s manuals, but its students still appears to be carrying out what they learned on the ground. Reason enough to close down this school for good. “The mine didn’t want to take us, the mine wanted us alive because we weren’t the bad guys, we were victims of the owners who pocket millions and never give a thought to the suffering of the poor." In the document addressed to the U.S. Department of State, Hodges said embassy officials believed Correa was aware of supposed corrupt practices by former national police chief Jaime Hurtado, but that the president named him to the post anyway because it would make him more easily manipulated. This December marks 30 years of CISPES (Committee in Solidarity with the People of El Salvador).